Phosphorus (P) loss from agricultural fields through surface runoff may contribute to the eutrophication of surface waters. 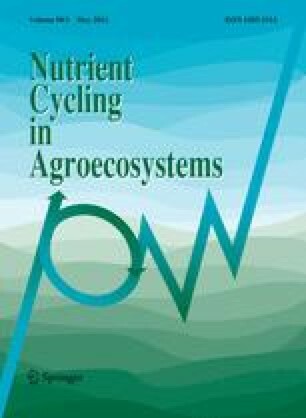 The objective of this study was to evaluate surface runoff and P transport from different cropping systems during 2007–2009. The treatments consisted of a control (wheat/fallow) and three double cropping systems: wheat/corn (Zea mays L.), wheat/cotton (Gossypium hirsutum L.), and wheat/soybean [Glycine max (L.) Merr.]. Wheat/fallow was not fertilized and had no crop planted during the summer crop growing season. The four treatments were randomly assigned to 12 plots of 5 × 2 m on a silt clay soil. Surface runoff from natural rainfall was sampled for P analysis during the 3 years. Double cropping systems, when compared with wheat/fallow, reduced runoff volume and losses of total dissolved P (TDP), particular P (PP), and total P (TP). Wheat/soybean was the most beneficial system reducing the 3-years mean runoff volume by 58%, TDP loss by 81%, PP loss by 89%, and TP loss by 85%, compared with wheat/fallow. The 3-years flow-weighted mean (FWM) concentrations of TDP, PP, and TP followed the order wheat/fallow > wheat/cotton > wheat/corn > wheat/soybean. The least temporal variations of the P concentrations and losses were observed from wheat/soybean. Therefore, selecting wheat/soybean as the main double cropping system appears to be a practical method for controlling runoff and associated P loss from farmland under similar weather and soil conditions. Funding for this work was provided by the Major Program of National Natural Science Foundation of China (No. 50639040 and 50739003).